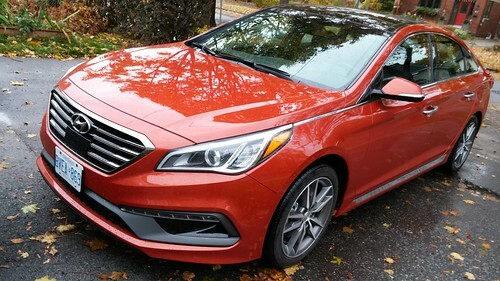 On Halloween, I exchanged my '99 Mazda Protegé for a week with a 2015 Hyundai Sonata. It was orange, of course. As usual when you borrow cars from a media fleet, it was fully loaded. We're talking a touch-and-swipe navigation screen, backup camera, heated front and rear seats, high-power audio system, LED running lights, and Bluetooth phone capability. Convenience features included the smart trunk, which unlocks when the proximity key is within three feet of the trunk for more than three seconds. Another useful item is the adaptive cruise control, which monitors the speed of the car ahead and adjusts the Sonata’s speed to maintain a safe distance. I could honestly see myself in a Sonata long-term. It's a very fun drive, and surprisingly roomy. 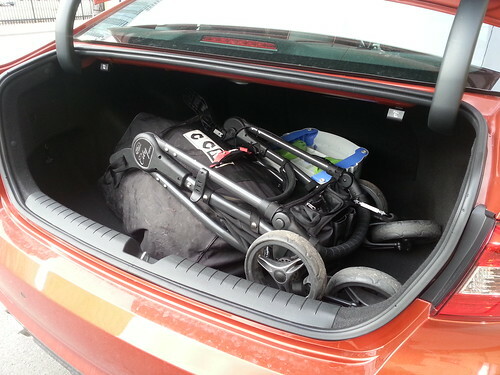 Five of us fit without that cramped feeling, and the trunk had room for both the baby stuff and my oldest son's hockey gear. 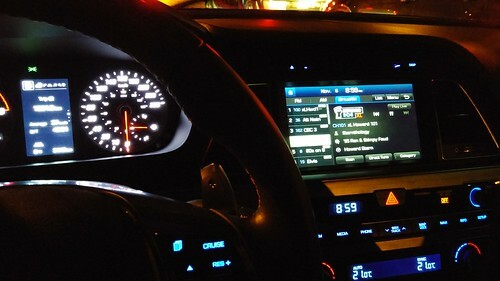 And the Hyundai truly gets the touch screen right. This car had Sirius/XM and it was easy to toggle between Howard Stern, FM/AM and my smartphone. The navigation system's interface was both intuitive and efficient. This is my second great experience test driving a Hyundai automobile. If they have a most improved award in the auto sector, it's got to go to Hyundai. Yeah you have to admit, Hyundai has definitely come a long way. I really like the Santa Fe. Mike, when do you test the Canyonero? At first, one bought a Hyundai because, well, it was cheap (price and quality). It wasn't too long before one would buy a Hyundai because it was at least decent, had a lot of optional-elsewhere features as standard equipment, and the final price made for good value, too. Now you can buy any Hyundai because it is outright a good car within whatever class you're buying. The bonus is that it is still good value and long-term quality is better than industry average. Hyundai has indeed come a long way. Mike I assume you have been listening to Howard for a long time like myself. I still listen but he and the show has taken a complete 180 since going to Sirius. It's actually painful. He is the ultimate hypocrite. You might as well call him Imus Stern. I still listen as often as possible. I still dig his show. I didn't notice a drop-off after moving to Sirius. Regarding Hyundai, I'm still bitter about my Mum's POS car that was the Pony in the late 80s. I could hear it rust on the driveway in the middle of the night. Just goes to show that as a consumer if you get burned by a product, you've lost them for a long time (if not forever). As for Imus, can *anyone* explain his appeal? I suppose he was ground-breaking earlier in his career, but today? Definitely slipping into demented angry grandpa mode. Yep... still trying to forget my awful Stellar experience in the mid 80s. Hyundai has come a loooong way. As for Imus, everything I know about him I know from Stern. Otherwise, I've never seen / heard him. Ah yes, the Pony. I knew a few people that had Ponies back in the day. For some reason my one buddy's mom loved hers, claiming it was reliable, never had any trouble with it and how good on gas it was. I'm guessing that was probably the one in a million. As for Sirius I had it for a couple of years. At first it was cool. Enjoyed the variety of programming not to mention Howard Stern. But then the novelty wore off. I found I was getting bored of it and was using less and less, till I finally just cancelled my subscription. And the price has gone up considerably since I last had it in 2010 so I doubt I'll go back to it.